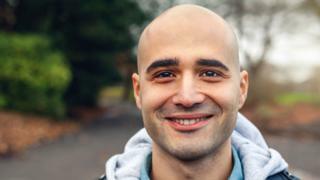 A potential new cure for baldness has been discovered using a drug originally intended to treat osteoporosis. Researchers found the drug had a dramatic effect on hair follicles in the lab, stimulating them to grow. It contains a compound which targets a protein that acts as a brake on hair growth and plays a role in baldness. Project leader Dr Nathan Hawkshaw told the BBC a clinical trial would be needed to see if the treatment was effective and safe in people. Neither is available on the NHS and both have side-effects and are not always very effective, so patients often resort to hair transplantation surgery instead. The research, published in PLOS Biology, was done in a lab, with samples containing scalp hair follicles from more than 40 male hair-transplant patients. The researchers, from the University of Manchester, first latched onto an old immunosuppressive drug, cyclosporine A, used since the 1980s to prevent transplant organ rejection and reduce symptoms of autoimmune disease. The scientists found that the drug reduced the activity of a protein called SFRP1, a key growth regulator that affects many tissues including hair follicles. But because of its side effects, CsA was unsuitable as a baldness treatment. The team went on to look for another agent that targeted SFRP1 and found that WAY-316606 was even better at suppressing the protein. Dr Hawkshaw said the treatment could "make a real difference to people who suffer from hair loss". Hair loss is a daily occurrence and generally nothing to worry about. Some types are temporary and some are permanent. A British Association of Dermatologists spokesman told the BBC: "This is a very interesting study. "As the researchers say, hair loss is a common disorder and it can cause considerable damage to emotional health, including loss of self-esteem and confidence. "That said, more research will need to be done before it can be used by people with hair loss. "For individuals with hair loss, treatments can be very hit and miss. There isn't one which is universally effective. "For that reason new treatments are exciting as they give people more treatment options that may be effective."